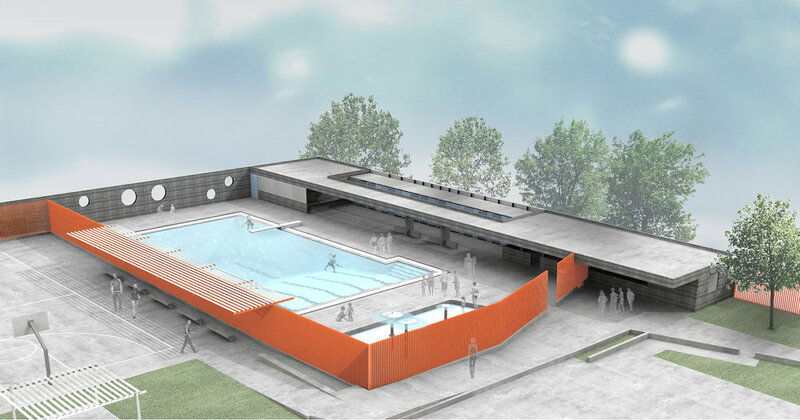 This project is a reinterpretation of the iconic recreation typology of the modern Southern California public swimming pool. 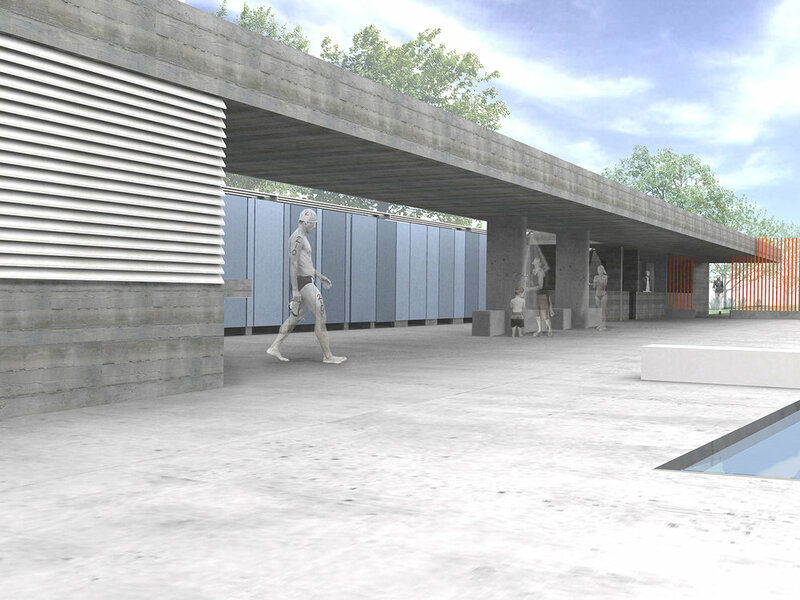 The project brings a new architectural reinterpretation of the enclosed bathhouse with all its program elements hidden within distinct male and female zones, into a contemporary gender-neutral, open-to-the-air configuration. The modern dressing rooms and restrooms are unisex and open at the floor, screened at the top. Sustainability is woven throughout by providing minimal heating and cooling loads, with naturally lit and ventilated spaces, and solar heated pools in this LEED design. Materials include board-formed concrete with a high fly ash content, clear-anodized aluminum louvers and tube steel fencing with all vertical members. The Sparano + Mooney Architecture design team collaborated with an artist whose public art is integrated into the concrete wall surfaces. These cast concrete murals depict historic figures of female immigrants involved in environmental activism in the community. Within the constraints of a $4M budget, the scope of the services included the design of a new 38' x 75' competitive pool with five lanes; a new modern splash pad with play features; a new pool deck and structures to house pool accessories and service equipment; new perimeter fencing and improvements to the site including drought-tolerant landscape, parking lots, recreational areas and spectator seating.